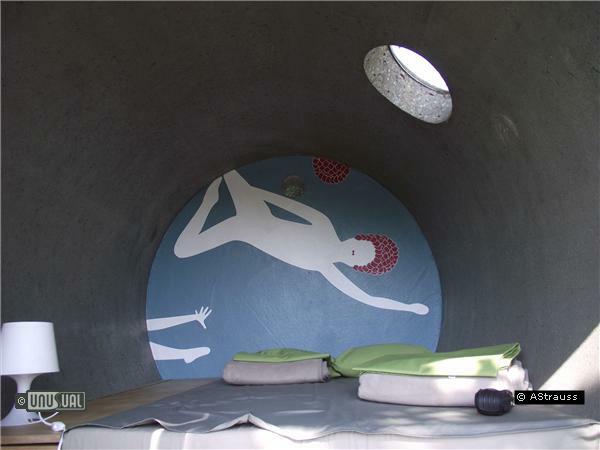 The idea of Andreas Strauss and first created as DasParkHotel in Ottensheim, Austria these concrete tubes provide basic hospitality, on a pay-what-you-wish basis. 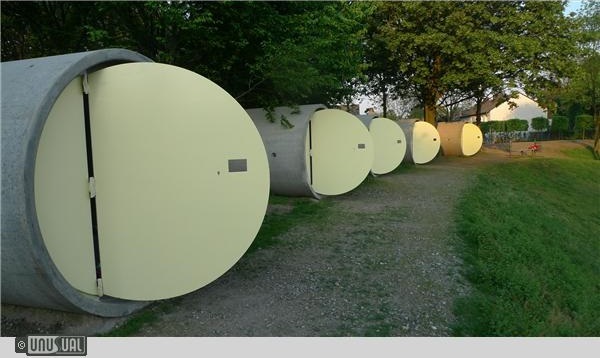 Constructed from 9,5 tonne concrete drain pipe sections they are cool in summer and warm at the end of season. 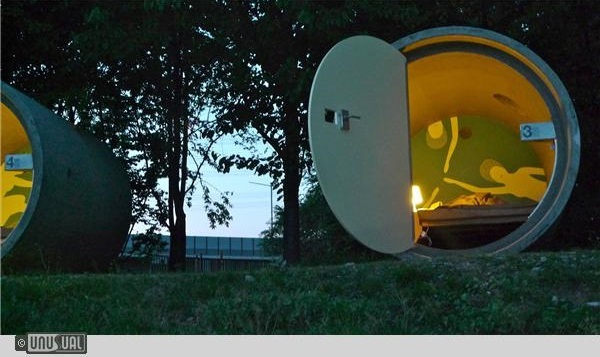 They're simple - but functional, and a great bet if you're cycling or want a change from camping. Surprisingly comfortable, they have a full head height interior, double bed, light, power, blanket and light cotton sleeping bag. All other facilities are provided locally. Robust, simple and safe - but WEB BOOKING ONLY.... no email!!! 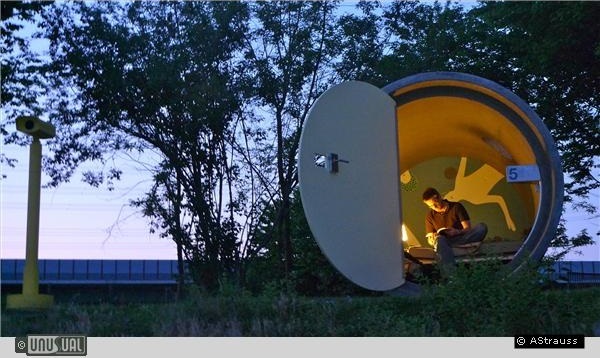 The Parkhotel's rooms are round like a barrel and they will provide you with maximum comfort in a minimal amount of space. You sleep on a double wide Eurofoam mattress supported by an ergonomic slatted frame by Optimo. In the storage right next to the bed you will find fresh pillows, blankets and sheets - plenty for even the coolest summer nights. Your luggage can be tidily stashed away in the storage space beneath and next to the bed. ParkHotel don't want your digital camera or mobile phone to die mid-trip; there is a 220V outlet for charging your electronic devices. Please bring your own toiletries (toothbrush, soap, towels...). Upon booking you will receive a code to allow entry to your personal suite. For the period of your stay dasparkhotel remains your all hours access safety zone - the charger for your personal energy reserves. Because DasParkHotel uses sanitation, breakfast and other hotel facilities from existing public infrastructure, it is possible for us to work with the very simple, user-friendly "pay as you wish" pricing. 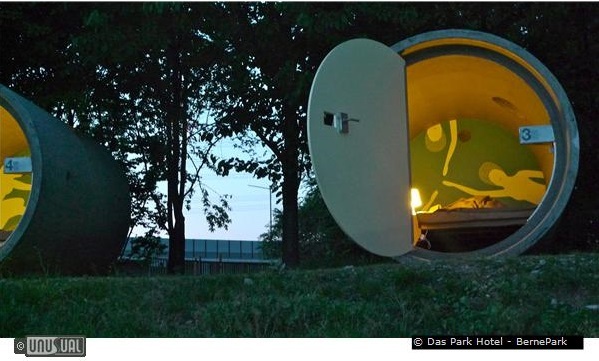 A night in dasparkhotel costs just as much as you can afford or want to pay. The dasparkhotel_bernepark is situated on the "Emscherinsel" in Bottrop-Ebel near Essen directly at the Emscher bicycle route. 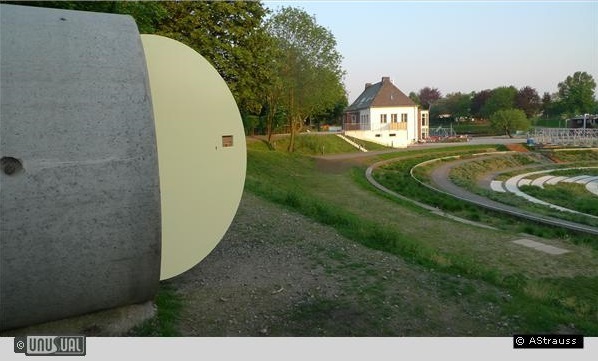 The location is in a park very carefully developed by the "Emschergenossenschaft" on the site of the old purification plant. There are five suites in the middle of a versatile and diversified neighborhood and very close to the Restaurant "im Maschinenhaus" run by the social reintegration institution GAFÖG. This is the closest resource in terms of nice food and local extra infos. Wonderful experience. Very interesting and cozy. If you are in the area it is very recommendable.